When you are redoing your home, what is the one thing you seem to forget to redo? LAMPS! That’s right! I have updated my living room a few times in 10 yrs of living in my home and I have never updated the lamps! Thanks to Brightech Lighting, I have 2 awesome Maxwell Drawer, Shelf & LED Floor Lamp Combination to put in my living room. Brightech lamps are perfect for a housewarming, Christmas or any other kind of gift. You can’t go wrong with these lamps. I have 1 lamp up and I love it! The lighting is perfect, I have my chargers, remotes, and other things in the drawers which is fantastic! NO more hunting for the Blu-Ray remote! LOL I also have a few favorite pictures on the shelf. I haven’t put the 2nd one up yet, but I will soon. Define your space and set your mood of choice with an LED floor lamp that fits your unique style. Brightech designs run the gamut from arc to torchiere to tripod and beyond, so you can curate looks you’ll love. This tall freestanding lamp lends a soft ambient glow to contemporary spaces while also providing 3 tiered display shelving and drawers for added convenience. Style and function combine to brighten up any room. 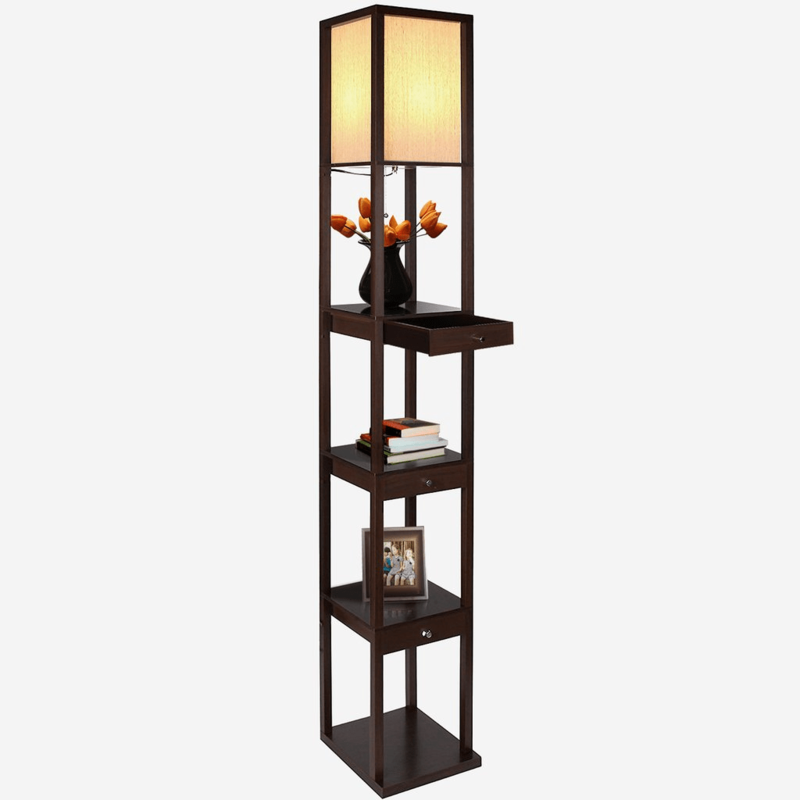 The lamp provides storage and display areas for vases, books, Blu-Rays, or other items. The drawers are perfect for storing small items such as charger cords, remote controls, and more. Utilize the convenience of this floor lamp in your bedroom, living room, or office. The Maxwell Floor Lamp works perfectly in your office, living room, den, dorm room, bedroom, or wherever you might need soft warm light, shelving, and drawers. Use the display shelves to show off your favorite collectibles, flower vases, or travel items. Utilize the drawers to store small items and stay organized. This Lamp comes in black and havana brown and stands 72 inches tall and each shelf is 11 inches square. You can purchase your lamp on their site, Amazon, Wayfair, and Walmart.